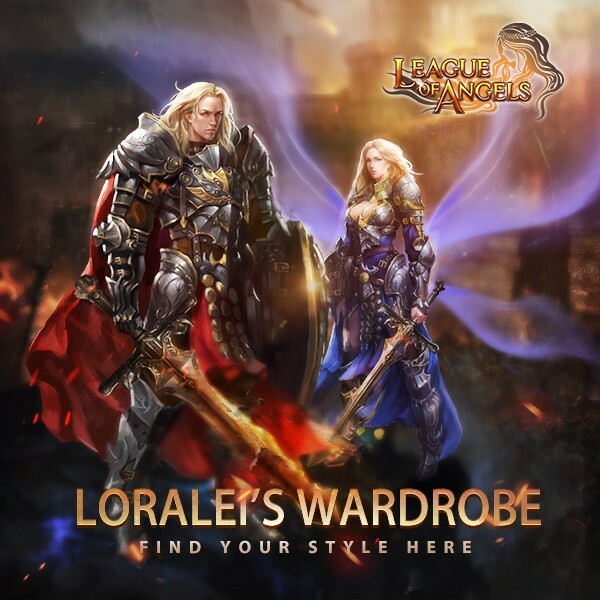 LoA_Enjoy Loralei's Wardrobe and Event Bonus! Loralei's Wardrobe is a feast specially for fashion! It consists of 2 different components, diamond purchase and voucher purchase. During the event, the more players who purchase the same items, the higher discounts they can get for the items. The discount can be as high as 50% off. The costumes in this event include Cinderella, Saintly Angel Wings, Medieval Armor,Phoenix Wings, Sky Archer,Lover's Reunited, Superior Santa Clothes, Elvish Spring, Legacy, Superhuman, Iron Wings, Mysteral Wings, Hang Ten, Moonbeam Wings, Sterling Moonbeam, Bat Wings, Wings of Rhythm, Gold Organza, Wings of Gold. 1.During the event, the more players who purchase the same items, the higher discounts they can get for the items. The discount can be as high as 50% off. 2.If you bought an item at a higher price than the final price, the system will automatically calculate and return you the price difference after the event ends. For example, if a player has bought an item priced 3600 Diamonds, after the event, the price of this item might drop to 2000 Diamonds, he will get 1600 Diamonds back. 3.Aureus can be used in the Loralei's Wardrobe to purchase certain items. 1 Aureus is worth 1 Diamond. Aureus can be obtained from the events Total Recharge and Today’s Gift,etc. 4.If the purchase involves Aureus, the Diamonds paid with Aureus will not be returned. For example, a player has bought an item priced 3600 Diamonds, with 3200 Diamonds and 400 Aureus, after the event, the price of this item might drop to 2000 diamonds, he will only get 1200 Diamonds back. Tips: Group Tickets are still valid for the next Loralei's Wardrobe event. 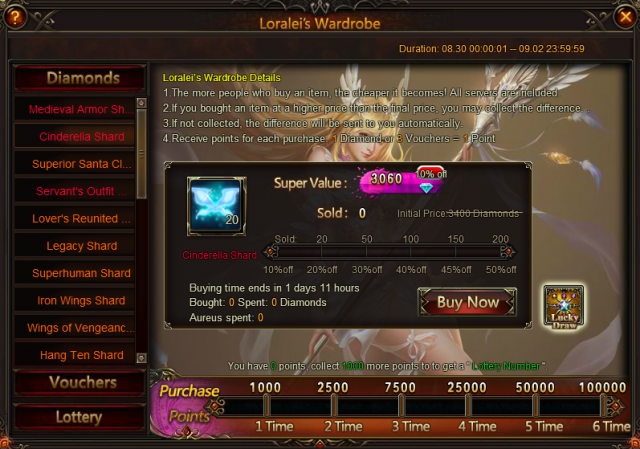 The first time each day a player buys each specific item in Loralei's Wardrobe, they will get a chance to draw in Lucky Draw. Prizes include Loralei's Wardrobe points and Vouchers. There is also an item that gives a 100% refund on the first purchase of the day! 1.Aureus points are rewarded to players every time they make a successful purchase. These points can be used in the lottery. 2.Players choose a number from 1-999. 3.After the event, 1 lucky number will be chosen by the system. The player who has chosen the same number will win 5000 Diamonds! Those who do not win the Big Prize will receive Vouchers according to the amount of Lucky Numbers they have. 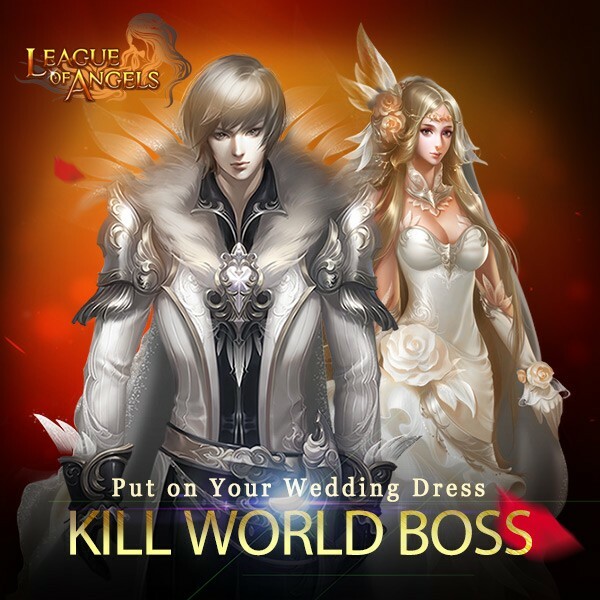 Possible Prize: Wedding Garb, Lucky Capsule, Card Lotto Vouchers, Seraph's Stone, Element Scroll, Blessed Stone, and Vouchers. More exciting events are coming up through Aug 30 to Sep 3 (Server Time), check them out in the in-game Hot Events menu now!